During the quarter-century when US 6 went all the way to the Pacific Ocean, "westbound" travelers actually got only as far west as the San Fernando Valley. From there, the route was overlapped along with US 99 back southeast to downtown Los Angeles. There those two designations diverged, and US 6 traffic was routed southward via Figueroa Street. At Pacific Coast Highway (which was known as "State Street" until sometime in the 1940s), drivers were directed east (along with southbound US 101A), towards downtown Long Beach. 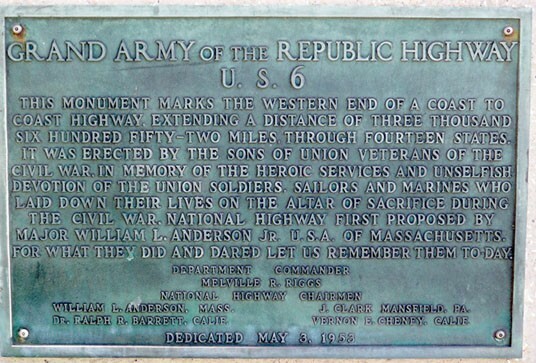 That's right: travelers at the western terminus of US 6 were actually heading due east. While that was an unusual (but not entirely unique) situation, it is even more interesting when one considers that, some 3600 miles to the east, travelers at the east end of US 6 were actually heading west around the spiral of Cape Cod. 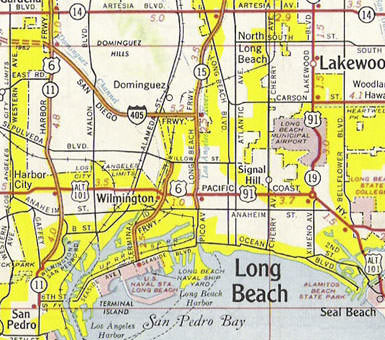 So where exactly in Long Beach did US 6 end? Where was this sign posted? ​That was looking west on PCH at Atlantic; for many years this was northbound US 101A. At one point, this would have been the south end of US 91. 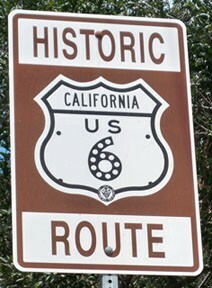 The west beginning of US 6 was straight ahead, and CA 15 began to the right. "[In 1953] ...the Long Beach City Council authorized the placing of temporary U.S. Route 6 signs along Long Beach Blvd. in order to direct [Grand Army of the Republic] encampment traffic to the Auditorium." Obviously it is not the city council's job to sign state highway routes. 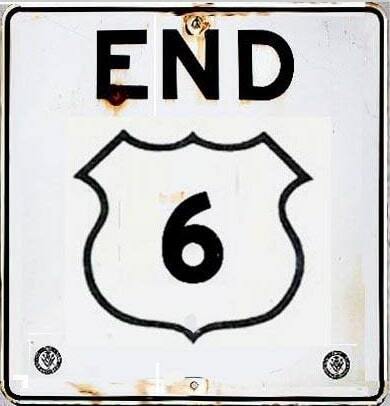 If US 6 had been officially extended down Long Beach Blvd, then it would not have been necessary for the city council to take any action, and the signs would not have been "temporary". So, despite the plaque's location at the Municipal Auditorium, there does not appear to be any evidence that US 6 itself was actually located there. Apparently the auditorium was torn down in the 1960s, and the bronze plaque was moved to its current location at the Long Beach Performing Arts Center (which was then known as the Terrace Theater). Again, this has led some to conclude that US 6 once ended at the location of this venue (Long Beach Blvd and Ocean Blvd). But, as with the old auditorium, that is not necessarily true. Actually, it is more likely that these two buildings were simply appropriate public locations on which to mount the plaque, but their locations had no bearing on the actual routing of US 6. Steve also recalls that during the 1950s and '60s, US 6 was signed east/west throughout the state (despite its generally north/south direction), and that this was a continual source of complaints to the highway department. The situation was particularly confusing in the area shown on these maps, approaching Long Beach: travelers heading east would see signs posted "West US 6" and "South US 101A". 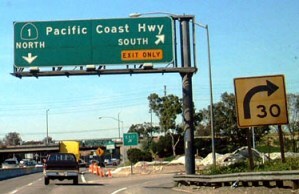 That exit to southbound PCH was probably the south beginning of US 91 for a few years. Continuing straight ahead under the overpass, the cloverleaf to northbound PCH was probably the west beginning of US 6. At any rate, it was not long before both routes were significantly shortened: in the mid-1960s, US 6 was truncated to its current terminus in Bishop CA, and US 91 was cut back to Barstow for a few years before it was completely eliminated from California, Nevada, and most of Utah. At about the same time, the south end of US 101 was changed to downtown Los Angeles, and since then Long Beach has not been served by any US route. last updated Dec. 26, 2018.